At the reading of the will, Grace discovers that Rosamund kept the life she lived before Grace was born a secret. That secret is now to be revealed to Grace in the form of seven letters, written by her mother, just before she died. Entranced by the British landscape and caught in a brief but perfect moment in time, Grace and Alasdair travel to four enchanting locations, walk in Rosamund’s footsteps, scatter her ashes, and read a letter at each one. What follows is an emotional, fun-filled, and adventurous journey of a lifetime, on which Grace slowly uncovers the truth about Rosamund’s incredible life story, leading both Grace and Alasdair to question their futures and address their own secret demons from the past. But can Rosamund’s puppeteering from the grave alter life’s course for Grace, or will things take an unexpected turn? 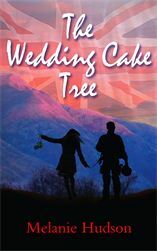 The Wedding Cake Tree is available on Amazon as paperback and as a Kindle download.